Branding & Ecommerce & Marketing. Branding, Strategy, Digital Marketing and Ecommerce Development. 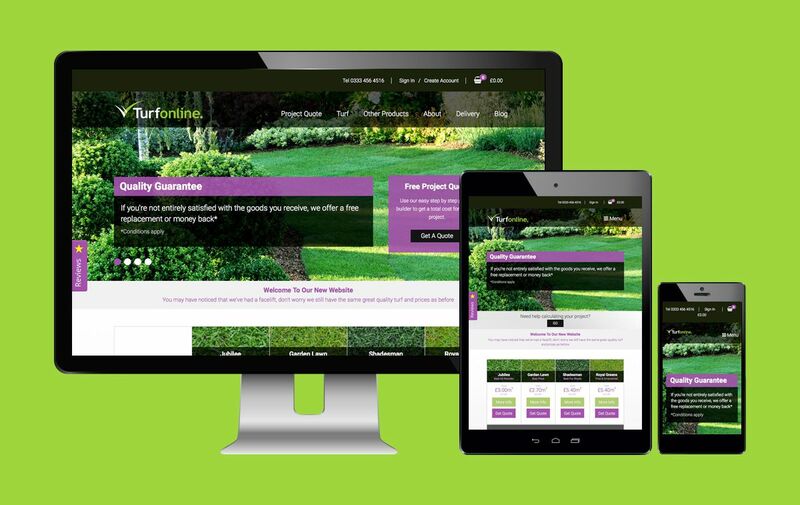 We were first approached by Harrowden Turf in 2013 and offered the opportunity to work closely with them on creatively uplifting and increasing the level of engagement and conversion on their four retail B2C turf websites. Based in Northamptonshire, the company, until that point had been trying to develop several online turf brands that all resided on Magento, but with only one person working on all aspects of several projects encompassing creative, communication and technical, it was becoming difficult to manage and deliver solutions of the standard the brand and company required. Brave were commissioned to utilise our entire team of people – with wide and varied skills across a number of disciplines – to provide online customers with a far more professional and credible image through improved user interfaces. This would provide a slicker buying experience, which ultimately delivered a considerable return on investment through increased conversion. Our recommendation was to carefully look at the overall brand strategy for the entire group of companies, including all of the individual subsidiaries which were somewhat fragmented, disjointed and far from clear. Initially setting out with the challenge of redesigning and relaunching the Stewarts Turf website, a site with a target audience of Scotland, we quickly proved our ability to put together an engaging Magento solution for the Scottish market, which gave Harrowden the confidence to make Brave a more integral part of their business. Since successfully relaunching the Stewarts Turf website, we have been commissioned to create a forward thinking brand strategy for the whole of Harrowden Group. This included subsidiaries for Harrowden Turf which contain all of the individual turf brands, Turf Online, Stewarts Turf, Turfland, Q-lawns, Spearhead Turf, Soil Online, Enviromat, and Meadowmat. The Harrowden Turf group branding took precedent in the process. This is a family run business, so this essence needed to be remembered whilst also reflecting a corporate feel. Well before we put pencil to paper and creating our first creative scamps, we spent some time in refining the brief. The usual process of brainstorming and presenting ideas that we strongly felt reflected the core business values followed. Taking the whole process through several creative stages, competitor research and further discussions with the key decision makers resulted in what you see here today. The core business is represented by the stylised blades of grass, which double up as the ‘H’ of the corporate name. Sympathetic colours have been utilised to further unite the logo with the product Harrowden Turf sell. Font usage was refined to work across all channels, so when we created the Brand Guidelines, firm rules for visual and written communication were set. Tone of voice reflected the values and aspirations, whilst online and offline guides set seed to all communication. Now that we had the overall corporate brand guide in place, we were asked to merge in some of the group subsidiaries. Harrowden believe in strength in numbers, a unity reflecting their family values. Rolling this out across the sub-brands followed – the blades of grass iconic shape and font usage remaining constant – resulting in a unity of collective businesses, each independent, but drawing from the strength and benefits of each other. 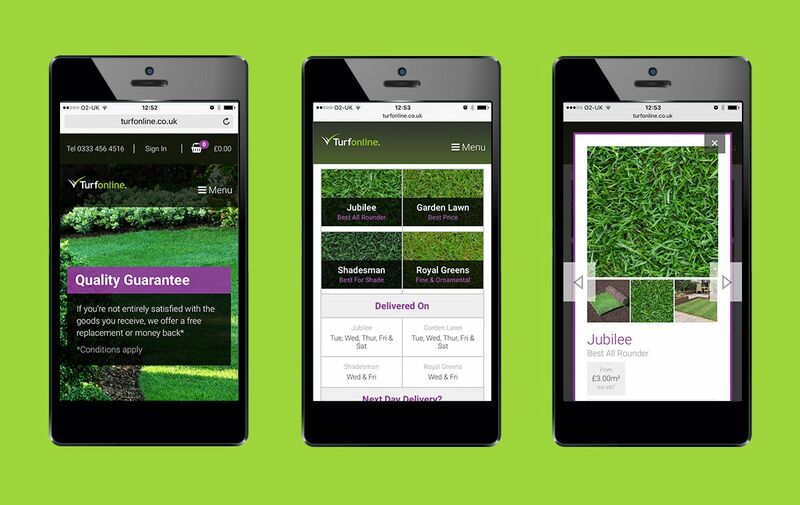 We now manage a significant number of Magento websites and domains for Harrowden Turf. 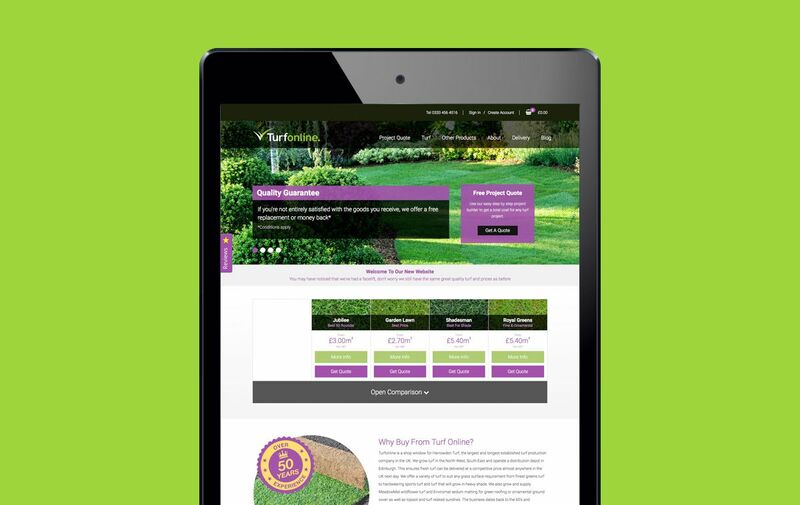 With Stewarts Turf and Turf Online, we have now developed highly bespoke user experiences to support and guide retail customers through the process of purchasing turf online. We creatively developed, wireframed and coded these user journeys to offer an optimal experience, which aimed to positively improve the whole customer experience, increasing conversion and average order value. Our analytical, creative approach has proven successful at achieving all objectives. By offering a number of ways for customers to access important product information, such as: offering comparison tables so that customers can compare and contrast individual turf options on a single page, and provide a highly intuitive way to build a project quote, we have completely transformed the buying experience from one which was quite clunky, to one which is now informative and intuitive. We continue to work with Harrowden to refine each one of their web properties. We are continuing to provide evidence-based consultancy, guidance, expertise and analysis to help steer their future strategies, continuing to refine, evolving their online presence and digital marketing strategies alongside each one of their businesses. Technically, our in-house developers and system administrators are always being pushed and tested to their limits by Harrowden’s constantly evolving demands. We manage all of the Harrowden websites’ dedicated server hardware, which has all been fully optimised for Magento. With emphasis on ultimate front-end and back-end performance, security has been taken incredibly seriously. Beyond the obvious Magento configuration challenges with highly specific delivery times, cut off times, lead times etc, we have also been asked to develop highly bespoke software which seamlessly pushes Magento orders, customers and invoices into the back-office software. This allows the Harrowden back-office team to manage a considerable number of orders during peak busy times, supporting them with logistical management and processing. Regardless of how challenging and how bespoke the requirements have been from Harrowden, Brave’s in-house technical team have so far risen to every challenge and continue to support Harrowden with the constant evolution and streamlining of their business, which positively impacts on efficiency and a refined customer experience.